Frontier City 411, a fan group for this park, says there will be an announcement tomorrow at 2pm that we won't want to miss. I assume that means they'll announce the new ride. A 20-passenger flume ride from Hopkins/Skytrans Manufacturing with a basic up and down oval layout. One of these rides was just installed at a park in Alabama last year. These rides are cheap, can be set up fairly quickly, I assume they are being marketed fairly heavily due to the new Skytrans partnership, and of course: they make a huge splash. This speculation is highly optimistic and is based entirely on the fact that they put splash imagery in their teasers, and on what I see on the market right now that would give them a splash to tease about. This ride would fit right into the park, both physically due to it's small footprint and in a crowd pleasing sense due to the high number of people that can be entertained and cooled off at once. This is one of those rides that makes a huge splash that gets both riders and nearby spectators soaked. After looking at the park's website and seeing that they are literally marketing "something new for 2012" I can't see how they wouldn't be planning a new ride, unless they are really, really bad at marketing. And yes, this is something that can be built in a few months. Alabama's began construction in January I think and was open in May. I don't know though, this is Frontier City after all and I'm so used to disappointment it hurts, but there are new owners now and the more I think about this the more it makes so much damn good sense for them. I just hope it's a ride of some sort. So the announcement was actually a leak by FC411 that stated that the coming attraction will be a water fortress style play structure with attached pools of some sort. Basically a mini water park. The old HR/old Six Flags HW building will be converted to changing rooms. I'm a tiny bit disappointed that its not going to be a ride, but I'm glad the park is making another investment and I do believe this will really help the park attract more young families, especially during the really hot season. The heat of last summer was really bad for all the dry parks, so having something cool to promote will help out a lot. This probably won't get me in their gates next season, but the wandering thrill seekers really shouldn't be their concern anyway. Small parks need to focus on families above all else these days to survive. Adding thrills will just attract teens, and they are hardly worth the ticket price to let in. Is there concept art around for that yet? Possible mock ups?? I wont go but it sounds interesting! I'm not a huge fan of this attraction either, but Six Flags Over Georgia did this same thing a couple years ago, and I've read reports that is it always packed. So maybe this will turn out well for Frontier City too. I would be really happy if they would just make Wildcat a decent ride like it was when if first opened (before they neutered the ride after the turn around). Get the tunnels back, and the double down into the splash zone - right now it's just a bunch of flat track that does nothing. Maybe next year will be the year for some great new coasters for the area (SDC, FC, WoF, SFOT, and SFStL). 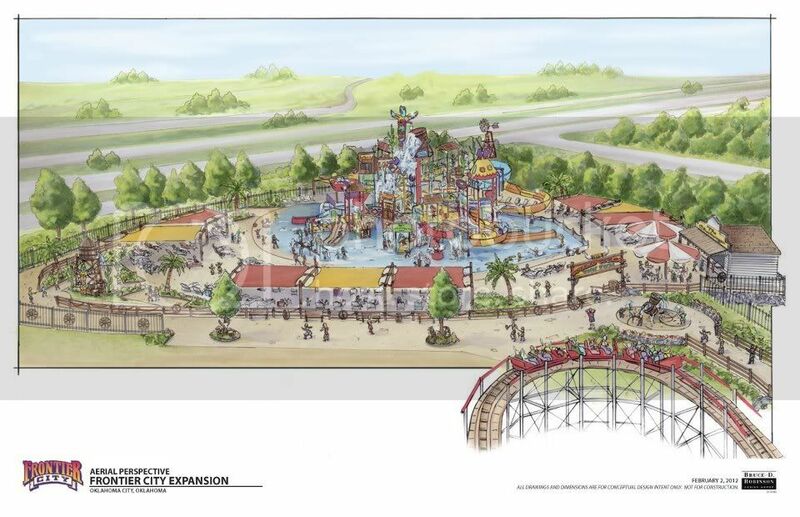 Frontier City is proud to announce new to the park in 2012, Wild West Water Works, Oklahoma's largest water activity structure! This exciting new water feature is over 5 stories tall with over 198 ways to get wet, eight colorful slides, a 1,000 gallon tipping bucket, spacious lounging deck, changing facilities, showers and more, creating the ultimate water oasis for guests of all ages. Sounds like it will be a lot bigger than I was expecting. This is very much like SFOG's addition a few years ago that Cowboy mentioned. They're spending about $1.3 million on it, which is a pretty big investment for FC. This is a very wise addition for FC. They need to keep building up a reliable base of young families for customers and get away from just catering to crowds of unruly teens. It sounds like it has been receiving a good reception from the core audience so far. The water fortress was announced by the park today. Here is the artist rendering. 2012 - Wild West Water Works - (2/20/12) Frontier City has confirmed the addition of Wild West Water Works for 2012, the largest water fortress in Oklahoma standing 5 stories tall with 8 slides and a 1000 gallon giant water bucket at the top. Concept artwork was posted to the official park site. I dont see myself cruising over to FC for this. Its not original. I can go to WW or Grand Country Inn for something like this. Sounds like the park has been fairly busy this season already. People are actually complaining about the lines - that's a huge step for FC! They've got more good concerts planned, which is a forefront of their business now, and a number of people are pretty excited about the water play structure that opens next weekend. I say all this because it seems like the park is really growing in popularity and being well-managed for once. That means big things are ahead of us. I think most of the local enthusiasts underestimate the importance of this year's addition. It's a huge addition for them, it shows they're ready to really invest in the park, it's going to really increase their customer base, and I definitely think the success of this attraction will lead them to add another major new attraction for the other part of their base: younger thrill seekers. The rumors are pointing to WWB getting a new attraction next summer rather than FC. In case anyone hasn't heard, Eruption has left the park, leaving a fairly sizable space for major attraction. I expect to see them throw in something thrill-oriented there by 2014. Looks like another good addition for the OKC parks. I expect it will revive a lot of interest in WWB. This is exactly the kind of unique, major attraction they need to get noticed again. Here's hoping they do the same for FC in 2014. 1. Wild Kitty is dismantled and is stacked in the parking lot. I couldn't tell if they were rehabilitating the whole ride, or replacing it with a similar ride. Anyhow, something is going on there. 2. Eruption is still standing, no work has started in that area. 3. The Silver Bullet train is sitting unprotected in the grass employee parking lot. Not sure if this means they have a new train on the way, or if it is just there for winter storage.